I am going to try something a little different here. And it seemed to me that a blog named the Bellbottom Blog would be the perfect place to review this book. So, gather around kids and let me take you back to a mystical time called the Sixties. 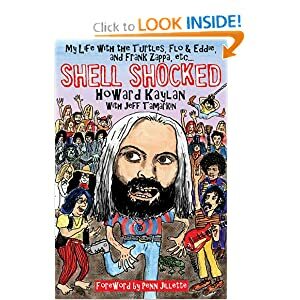 The band is The Turtles, The lead singer is Howard Kaylan who just happens to be the author of Shell Shocked, The energetic man on the tambourines is Mark Volman. The man introducing them was Ed Sullivan. Getting on the Sullivan show was a huge deal back then. He was on Sunday nights and owned his time slot. EVERYBODY did that show. Howard and Mark have been friends for decades. The book though is really Howard’s story. How he navigated his way through rock stardom, lousy deals with record companies, drugs, women, marriage, divorce, the end of rock stardom….quite a list, huh? I was reading along and about halfway through, I wondered how in the Hell he could remember all of the things that happened to him. I swear when I turned the page, he explained it. He kept a diary since 1968. I’m still not sure how he found the time to jot all of it down as it was happening. After the Turtles wound down, there was Frank Zappa bringing Howard and Mark into the Mothers Of Invention. Mark became Flo, Howard became Eddie. Flo and Eddie had several opportunities to do background vocals for T Rex, Alice Cooper, and a host of others. Their most notable contribution was as backup singers to Bruce Springsteen on Hungry Heart. Hear them? They have an unmistakable sound. Hungry Heart went to #5 on the Billboard charts. As the book nears the present, Howard seems to have found a lifestyle that suits him. Every summer, they get together with a few survivors of the old days and do a tour. This year, Gary Puckett ( Gary Puckett and the Union Gap) , Mark Lindsay (Paul Revere and the Raiders) , Gary Lewis (Gary Lewis and the Playboys) and Chuck Negron (Three Dog Night) are joining the guys, who have their original band name back. Back to the book for a minute. Howard lays out how his life was in a straightforward way. No apologies. The book is as messy as rock and roll at its best can be. It was one hell of a ride and I’m glad he shared it with us. If you know the music of the Turtles, you are probably wondering why I haven’t mentioned Happy Together yet. It is their most recognizable hit. I think the lyric is a little sad. I know it’s sung in a very upbeat way and I love it. Still it really seems to be about someone wishing for something he isn’t going to achieve. I resisted the urge to quote large chunks of the book. Go buy a copy and read it. I did. Books like this one give me a different perspective on that era and the music from it. It enhances the appreciation I have for the music of my youth. So, thanks to Howard for writing this book and for all the great music.